Shopping for Star Trek Backpacks? Stylish Star Trek backpack can hold your tablet and laptop! Measures 19-inches tall x 12 1/4-inches long x 8 1/2-inches wide. Includes headphone access, a padded handle grip, and a tri-color applique that pays tribute to your favorite TV series! A top of the line backpack for new recruits, this Star Trek Original Series Retro Tech Backpack features a tri-color applique that runs along an angled zip front pocket for a unique, cool look! The mixed material backpack features front adjustable cinch straps, external zip pockets, a top zip entertainment pocket with rubber grommet headphone access, and a padded handle grip. The interior pocket fits tablets up to 11 3/5-inches tall x 7 1/3-inches long x 1/2-inches wide along with additional storage. There's a back external padded zip pocket for laptops that fits up to standard 15-inch laptops. 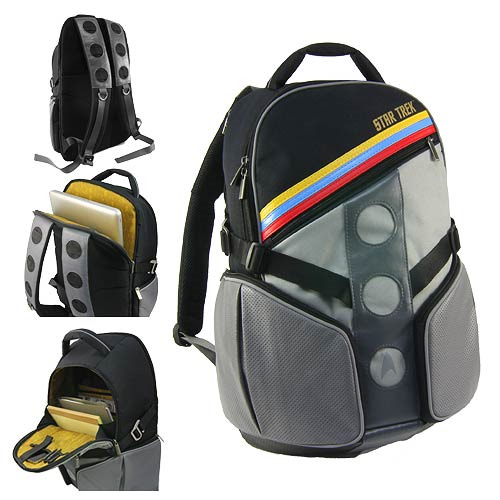 The Star Trek Original Series Retro Tech Backpack measures 19-inches tall x 12 1/4-inches long x 8 1/2-inches wide. Ages 12 and up.